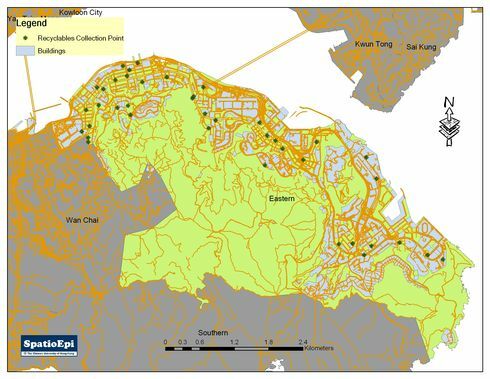 The map shows recyclables collection points (from Food and Environmental Hygiene Department, HKSAR Government) in Eastern district, Hong Kong. At each collection point, recycle bins are displayed in three different colours, for paper (blue bin), metal containers (yellow bin) and plastic materials (brown bin). Most of the bins are close to buildings (in light blue polygons) and are accessible to where people live or work. Recycling is but one of the waste reduction measures in urban setting. It normally requires changing a small part of one's life style, such as categorising home wastes and placing the recyclable items into appropriate recycle bins. Accumulation of domestic waste is an emerging problem in our society. If unchecked, the continued growth in wasteloads means that Hong Kong will soon be running out of landfill capacity. It is estimated that the current landfills will be saturated by 2010. Waste is a common problem of affluent societies. Like many other developed countries, the overall waste production in Hong Kong has grown together with the economy. The per capita level of municipal solid waste disposal has risen from 1.28 Kg per person per day in 1991, to 1.36 Kg in 2007. In 2009 it remained high at 1.18Kg, and was the highest amongst Asia's "Four Little Dragons". Although waste reduction often reminds one of recycling, minimising waste production at the first instance is a more crucial measure that everybody should adopt.